The most spacious wheelchair-accessible vehicle in the industry, the BraunAbility Chrysler Pacifica features patent-pending AccessAbility™ technology, including an aerospace-inspired sliding door extension and the industry's widest side-entry ramp, with rear-axle space innovations and cantilevered seat bases that expand interior cabin space, maximizing space for obstruction-free maneuverability for all sizes and types of wheelchairs. BraunAbility seamlessly integrates with the sophisticated styling of the Chrysler Pacifica. To ensure Chrysler integrity and quality, BraunAbility sources its components through the same suppliers, and crash-tests to the highest automotive standards. 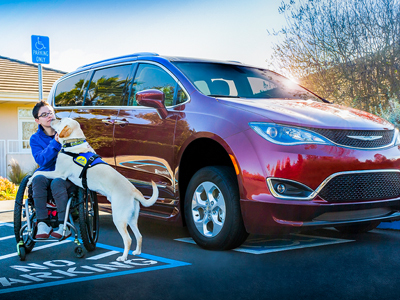 "BraunAbility and Chrysler Pacifica are a natural fit as a partner for Canine Companions for Independence," says Canine Companions CEO Paul Mundell. "Canine Companions was the first and now largest provider of assistance dogs for people with physical disabilities. The synergy between adapted vehicles like the BraunAbility Pacifica and the intelligence and life-changing skills of a Canine Companions assistance dog are seamlessly giving independence — and giving a dog a job. Seeing a Canine Companions assistance dog working with their partner in and around an adapted vehicle is a testament to the adaptability of our assistance dogs and their ability to enhance independence for a person with a disability." The 2017 Chrysler Pacifica reinvents the minivan segment with an unprecedented level of functionality, versatility, technology and bold styling. Re-engineered from the ground up on an all-new platform, the Pacifica delivers class-leading gasoline and hybrid powertrains to the minivan segment. With more than 100 available safety and security features, the all-new Uconnect Theater rear seat entertainment system, and a full array of comfort and convenience technologies, the Chrysler Pacifica is a no-compromises minivan ideally suited for today's families and has earned its spot as the most awarded minivan of the year. The Pacifica Hybrid takes this revolutionary vehicle a step further with its innovative, advanced hybrid powertrain. It's the first electrified vehicle in the minivan segment and achieves 84 miles per gallon equivalent (MPGe) in electric-only mode and 33 miles of all-electric range. BraunAbility is the world's leading manufacturer of wheelchair-accessible vehicles and wheelchair lifts in the mobility industry with more than 250 BraunAbility dealers in the U.S. and Canada. Founded nearly 50 years ago by Ralph Braun, the corporation was built on the age-old adage, "Necessity is the mother of invention." Ralph Braun was a young man who used a wheelchair and had no reliable transportation to and from his place of work. He built his first wheelchair-accessible vehicle in 1972 and since then the company has grown into the most trusted name in the mobility industry, bringing independence to millions of individuals across the world. Canine Companions for Independence provides highly trained assistance dogs free of charge to children, adults and veterans with disabilities. Established in 1975, Canine Companions has trained more than 5,000 assistance dog teams, with six training centers across the country in Northern California, Southern California, Florida, New York, Ohio and Texas, and over 3,000 volunteers nationwide. Canine Companions is recognized worldwide for the excellence of its dogs, and the quality and longevity of the matches it makes between dogs and people. The result is a life full of increased independence and loving companionship. For more information, visit cci.org or call 1-800-572-BARK.